POMONA, Calif. (Feb. 14, 2016) – Goodyear’s new D2747 drive tire for National Hot Rod Association Top Fuel and Funny Car teams made its competitive debut this weekend at the Circle K Winternationals at Auto Club Raceway. The Top Fuel and Funny Car teams include the most powerful cars in the world of racing and put tremendous demands on their tires, routinely accelerating from a standing start to speeds above 300 mph in less than 1,000 feet. For that reason, changes to the rear drive tires usually force teams to work hard to adjust to the new component. “I see no difference in the new tire,” said Funny Car driver Tim Wilkerson. “I used it (Friday).” Wilkerson said he also used the new tire during the preseason test at Phoenix. Steve Torrence won in Top Fuel on the D2747. Ron Capps won in Funny Car on the tire supplied by Goodyear through 2015, the D2681. The D2747 is the same size as the previous TF/FC tire but the new tire has minor construction changes and a new tread compound. The differences between the tires are so incrementally small that the NHRA is allowing teams to choose between the tires through the first quarter of the season. The D2747 stands 36 inches tall and measures 17.5 inches across the tread face. It stretches 115 all the way around the tread. To put that in context, a Top Fuel dragster measures 300 inches long. The tire mounts on a 16-inch wheel. 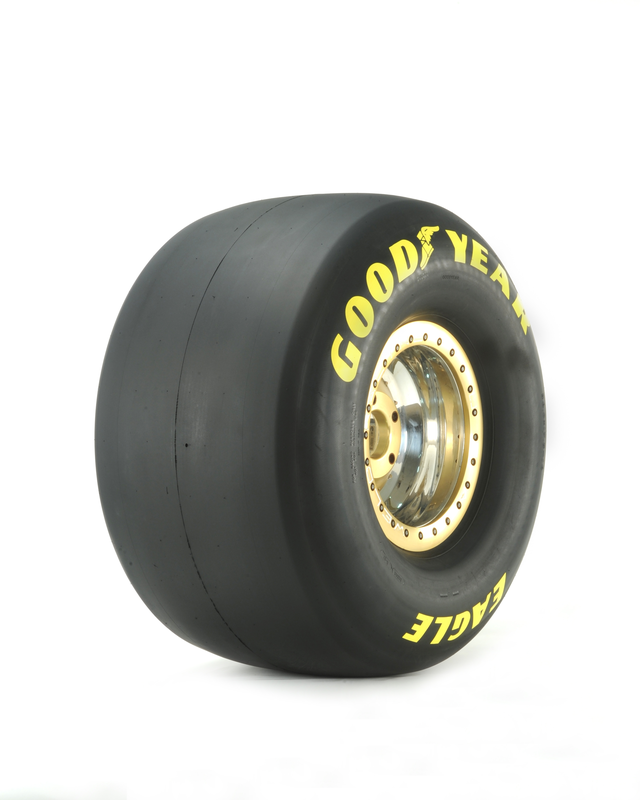 Goodyear’s D2H tread compound is the part of the tire that grips the racing surface. The Winternationals continue through Sunday.